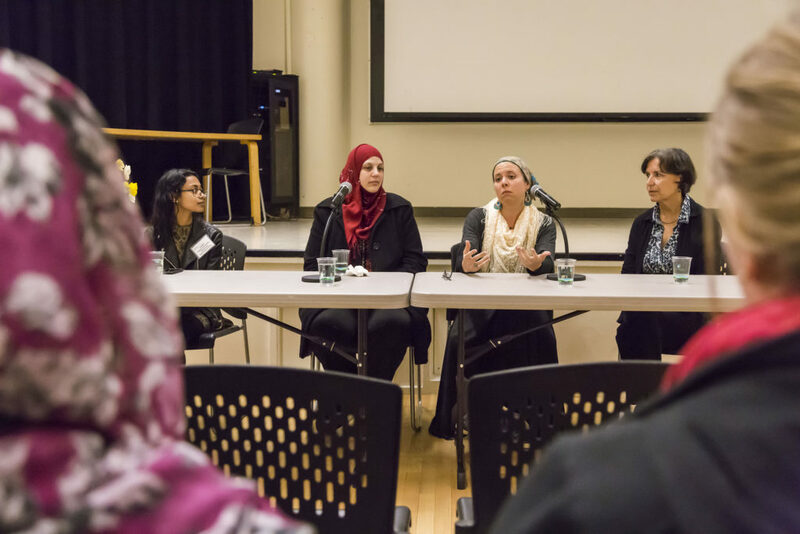 From left to right: UCSC inten Jacia Mim, film member Arwa Abushariefeh, film member Nur Laura Bean-Caskey and film director Dr. Rosemary Henze answer various questions about the Hijab’s implications in the women’s lives during the Q&A section of the event. Photo by Jasper Lyons. For Nur, the hijab is liberation, not oppression. For Dian, the hijab is about having a connection with God. For Mahsa, religion is not something to be worn but practiced, and for Arwa, her commitment to the hijab surpasses fear of harassment in the wake of the 9/11 terrorist attacks. The film “Just a Piece of Cloth” tells the narratives of four women and their views on the hijab. Film director, educational anthropologist and San Jose State University linguistics professor Dr. Rosemary Henze sparks a conversation around the identity of the hijab, bringing forth both opposing and intersecting sentiments. About 40 people gathered in Kresge Town Hall on Feb. 17 to watch the short film and seek shelter from the rain with a free plate of warm Halal food, food acceptable for Muslims to eat or drink under Islamic law. The screening is a part of the “Sister Solidarity” series put on by the Women’s Center in honor of UCSC’s women’s heritage month. Afterward, audience members posed questions to Henze and two women featured in the film, Arwa Abushariefeh and Nur Laura Bean-Caskey. The questions ranged from advice on how to gain confidence wearing a hijab to how different audiences reacted to the film. Many Muslims define the hijab as covering all but the face and hands, but interpretations of modesty vary. For this reason, not all believe the hijab is required by the Quran. Because of her choice to not wear a hijab, Mahsa, who is featured in the film, is often questioned by other practicing Muslims about her level of education and her ability to work in her home country of Iran. In the film, she commented on her experiences with these critiques, the struggle of wearing the hijab as a teenager and how she feels her religion is often defined by the hijab. The hijab elicits commentary within and outside of Muslim faith. In high school she was one of many Muslims who received prejudiced comments after the 9/11 terrorist attacks. She was targeted by individuals who grouped Muslims with the terrorist group al-Qaeda, because of the perceived shared faith. Arwa, also featured in the film, said if someone was looking at her with a puzzled expression, she would approach them without hesitation, ask what’s on their mind and answer questions. Henze addressed the varying reactions to the film — one of them being the conclusion that Muslim women are oppressed by the hijab’s coverage. She addressed the shared experience of being objectified as a woman regardless of background and how people choose to respond, whether that be taking pride in covering up or dressing down. As a professor, Henze acknowledged her “cultural capital” and desire to use it to ignite a dialogue around the hijab. “Just a Piece of Cloth” dissects the many stigmas surrounding it and creates a platform to unpack its misconceptions.